Corruption can’t be eliminated by institutions scrutinising themselves. Civil society must play a central, continuous role. 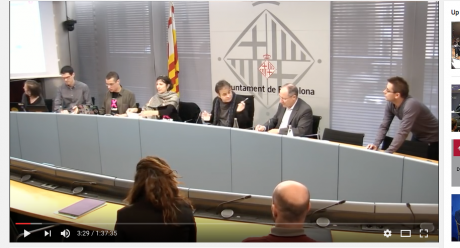 Xnet installs a Whistleblowing Platform against corruption for the City Hall of Barcelona – powered by GlobaLeaks and Tor friendly, January 19, 2017. Screenshot. Xnet, an activist project which has been working on and for networked democracy and digital rights since 2008, launches in the Barcelona City Hall the first public Anti-Corruption Complaint Box using anonymity protection technology like TOR and GlobaLeaks (known as “Bústia Ètica” in Catalan). The new digital device managed by the Barcelona City Hall, is inspired by similar mechanisms already operating in civil society (for example, the XnetLeaks mailbox), and implemented with advice from members of Xnet who have also set up a working relationship with the GlobaLeaks platform. The debate on what anonymity entails is one of the most up-to-date and relevant themes of the digital age, especially in the wake of Edward Snowden’s revelations. Accordingly, we want to explain why Xnet has insisted on the need to guarantee true anonymity in a project like the Barcelona City Anti-Corruption Complaint Box which combats corruption and other damaging practices that threaten good governance in the city of Barcelona. Xnet has provided for journalists and citizens a FAQ service [See a taster below] explaining how the Box works, describing the tools (for example TOR) which guarantee anonymity, and all the details relative to the first project of this type whose use is recommended by public institutions. Xnet has always espoused the idea that democracy can only exist if institutions work together in equal conditions with aware, well-organised citizens. The Box aims to provide a way to make this kind of teamwork possible. Corruption can’t be eliminated by institutions scrutinising themselves. Civil society must play a central, continuous role. What is the Barcelona City Anti-Corruption Complaint Box? The Anti-Corruption Complaint Box is a means by which citizens can denounce corruption and other practices that are damaging for good governance in the city of Barcelona. This is a digital device managed by the Barcelona City Hall, inspired by similar civil society mechanisms (like the XnetLeaks mailbox) and put into effect with advice from members of Xnet working from the Citizens’ Advisory Council of the Barcelona City Hall Office for Transparency and Best Practice. By means of the Box, citizens can send – in a way that is secure and permits total anonymity – complaints, suspicions and evidence of cases which they believe the City Hall should investigate. Once the complaints have been received, City Hall must respond to every single one and inquire into those that are deemed plausible, or send them on to the appropriate institution. The person submitting the complaint reserves the right whether or not to reveal his or her identity, and will receive evidence of the follow-up carried out in response to the complaint, which means that he or she can monitor the process. What are the reasons for the anonymity option? 1. First of all, we should be clear that the anonymity of sources in an investigation is nothing new. Evidently, if the information sent by a citizen ends up in a lawsuit, then it can no longer be anonymous. The public administration will then make the official complaint and anonymous communications will have served simply to discover proof which would never have been found without this mechanism. This is no different from the way in which the press has always worked: information comes from sources that remain anonymous because they are vulnerable. It is the responsibility of the person who receives the information, the person who has the relevant means – the journalist or, in this case, the administration – to carry out the investigation in order to construct a solid case or discard the information. This structure enables us to correct one of today’s greatest inequalities: the standing of the citizen before the administration and big companies. Administrations and corporations have the power to monitor and pursue us, while we, the ordinary citizens, cannot do the same. This creates the asymmetry which is the source of all abuses. Only by providing 100% protection for the privacy of ordinary people will we be able to defend ourselves and protect the commons from powerful organisations that can hide from us information that concerns us, and also take retaliatory measures. But let’s be clear about this. In no way are we proposing that the institutions should foster anonymous complaints or denunciations among equal ordinary citizens since this destroys solidarity and encourages people to inform against each other in the service of institutional power, thus worsening the asymmetry. We believe that there is no such thing as a nanny state but only a civil society which has its own channels for becoming mature. 2. Corruption and bad governance can only be remedied by means of scrutiny of citizens and never only “from within”. Moreover, this is definitely not a time when the institutions can engage in “consciousness raising” or teach civil society anything about the struggle against corruption. On the contrary, it is civil society which is now helping to get the institutions back on the right track. This is yet another reason why the Box should permit anonymous communications. Although we have also activated self-control mechanisms for the Box (where access to information is managed by more than one specialist employee so that the controller is also controlled) proper use of the Box depends on users also having control over what they have sent, and the use made of this information, without any danger of being coerced. Hence, users that remain anonymous, will have at their disposal a code by means of which they can, if they wish, demonstrate that they have made the complaint. 3. On no account do we recommend that institutions should replace the civil society channels by which citizens can make their complaints, for example the XnetLeaks mailbox. We are therefore withdrawing from the Citizens’ Advisory Council of the Barcelona City Hall Office for Transparency and Best Practice after having contributed our knowledge in order to create the Box. The exchange of knowledge has been extremely fruitful and is a good example of what we believe collaboration between institutions and civil society should be: a process of learning together. But the time has now come for us to go back to being external elements so that we can do our job as watchdogs. It is important that most of the work should be done from the institutions because this is where the resources are. Citizen mechanisms should only supplant institutions when the latter fail to do their job. Therefore, the recommended methodology advises the whistleblower on how to send the information to the Barcelona City Anti-Corruption Complaint Box, the branch of the administration that has the means to take action. However, once the time indicated by the administration for doing so has elapsed, the citizen who considers that the action taken has not been effective can make a complaint in this respect by means of citizen self-organisation mechanisms such as the XnetLeaks mailbox. If the information ends up revealing a case of corruption, then the administration’s management of the matter will be exposed in the process. 4. As we have noted, the difference between anonymity and confidentiality is that anonymity allows the source to control the use that is made of its identity and information. Trusting in confidentiality “guaranteed” by the institutions – simply taking them at their word – amounts to no more than an act of faith. Experiences of anti-corruption whistleblowing around the world in recent years clearly show that the “guaranteed” confidentiality offered by the institutions is a non-starter when compared with the anonymity offered by instruments like TOR, which offer greater control to the person who decides to expose a wrongdoing. The mechanisms that we propose and use with the anonymous boxes for leaked information allow a source to become visible, independently of the institutions, should the information be used to the detriment of this person or society. This is a way of preventing the concentration of all the power (information) in the hands of a few people – bosses, administrative officers – who can become all-powerful and a threat to everyone. 5. Some sceptics say that there is a risk that people will start making complaints without due thought. The fact of remaining anonymous would seem to give users more freedom to say things without proof that they are true, or with malign intentions. There is indeed a danger that improper use will be made of the Box, for example for reasons of personal revenge, and there is always the possibility that an avalanche of information will overload and collapse the Box, which is precisely the form of retaliation that the right-wing party, Partido Popular (PP), and others who oppose its creation have been considering. On the basis of our own experience we should say that it is true that some people tend to use this mechanism to settle personal accounts, or so that other people can sort out their legal problems, which may be legitimate, but these are strictly private matters and pursued for personal benefit. There is no question that the risk exists (and we, with XnetLeaks, and journalists see it day after day), yet we believe that it is a risk worth running since the upside is that use of the Box manages to break the chain of fear and omertà, the code of silence favouring the formation of networks which misappropriate resources, or make it impossible for everyone to prosper in the same conditions and without favouritism. For all these reasons, and the need to be rigorous about protecting sources, we have also created stringent mechanisms to ensure that people who use the Box frivolously or with illegitimate or harmful intentions will be swiftly prevented from causing further damage. Similarly, and in contrast with what is presently occurring, emphasis is given to the possibility of a defence on the part of those people mentioned in complaints so that they may refute slander, defamation and actions aimed at obstructing their work. This is currently not the case. Recently exposed bad practices from those previously responsible at the Catalan Anti-Fraud Office, who frequently used complaints in order to attack political opponents, rivals or personal enemies – thereby, thwarting any chances of finding legal solutions to problems – has taught us that such practices should be denounced from the moment they first appear. Any use of the Box for media purposes will be denounced and terminated. The Box works by means of the GlobaLeaks platform which allows the user to accede to it through the Tor network, a system that anonymises communications so effectively that not even the City Hall itself can learn the identity of the person sending information. The Tor network is a tool that improves privacy and security for Internet users. Browsing with Tor, users make a connection through a series of virtual tunnels instead of making a direct connection, which makes it difficult to trace the source of information and therefore protects the identity of the person sending it. The email interface used is GlobaLeaks, a free software project produced by the Hermes Center for Transparency and Digital Human Rights. Besides being used in Spain for citizen initiatives like the Xnet Box, it has become a valuable resource all around the world for dozens of activist and institutional initiatives. GlobaLeaks has worked directly in the installation of the Box making a very valuable contribution and helping the Municipal Institute for Technology (IMI) team in the transition to new paradigms. The propaganda of an obsolete regime spreads the idea that Tor is a “hotbed for criminals”. This is a typical attempt to criminalise the “Internet” whenever the chance arises. According to this propaganda, anything new is bad because it endangers the status quo. The reality is that these innovations offer more justice and more democracy. Users should be aware, for example, that sending an unencrypted email is like sending a postcard without putting it in an envelope. Anyone along the way between sender and destination can read it. In a few years from now, encryption will be as normal as sealing envelopes and not leaving them open because the regime says so. - European Parliament Science and Technology Options Assessment (STOA) on Mass Surveillance says that strong crypto systems are one of the few things that the public can rely on as a defence against mass surveillance. - Activists from all over the world join the global campaign for encryption. - Anonymity as a political value. People who use Tor do so in order to defend their privacy, and to protect their personal data and communications. It is especially in those parts of the world where the Internet is widely controlled, censored and monitored that journalists and citizens use Tor in order to investigate state propaganda or to express opinions opposing it. In any part of the world, whistle-blowers who work for government transparency and accountability of multinationals can use Tor to denounce misdeeds without fear of reprisal or persecution. Tor’s aim is to provide protection for ordinary people. At present, ill-intentioned criminals who know how to enter other people’s computers are the only ones who enjoy protection. These criminals have good reason to learn how to achieve a high level of anonymity and many are able to pay well in order to achieve this. Being able to steal and reuse the identities of innocent victims (identity theft) makes it even easier for them. Ordinary people, however, have neither time nor money to find a way of achieving online privacy. Tor seeks to be the solution to this problem.